Save BIG on multiple courses with one of our 2-year Empire Memberships! THE BEST WAY TO INCREASE YOUR SKILLS AND REVENUE! Pay only 1 price and attend all programs FREE! 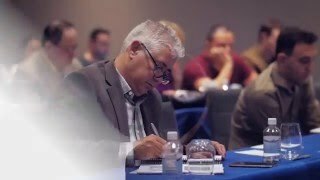 20+ years in business, Empire remains the only medical, educational institution to offer a “Membership Plan” as an effective method to acquire CME, learn new procedures, have “Complementary Access” to over 35 Live Workshops, and network with other physicians, manufactures, vendors, and thought leaders in the industry. Below is a full description of the different membership plans. Many of the benefits are common to each membership and the Membership Plan you choose really depends on the topics you are interested in learning. 21st Anniversary Special! - Expires soon! Now you can bring your staff to all programs FREE by signing up for one of our Office Memberships! Enjoy Huge Savings on Membership Fees! Send additional employees, staff, RNs, aestheticians and medical assistants, to all programs allowed in main membership with all the same benefits as Card Holder's primary membership. The office membership is our best option for training multiple individuals within a practice setting and is HIGHLY DISCOUNTED. Office Membership provides open access (One Time Attendance) to all courses. Tuition for repeat classes is reduced to $499 for members. Each staff member can attend all 25 Aesthetic, Medical & Anti-Aging workshops FREE with full access membership. Each staff member can attend all 7 Pain workshops FREE with full access membership. Each staff member can attend all 35 Aesthetic, Medical, Anti-Aging & Pain workshops FREE with full access membership. Special discounted tuition on 4+ attendees. Invite 4 friends to join or register to be matched with a group! Want a Full Access Platinum Membership at a reduced rate? Complete the form below to register to be matched with 4 other colleagues to take part in our Group Membership savings. (You must sign-up for the membership within 24 hours of being matched). All the benefits of the Platinum Membership. Join with 4 colleagues for only 3,599 each. Don't have 4 other colleagues at this time? Leave your name/phone number here and we will match you with 4 other of your colleagues. After the match, you must register within 24 hours. Want a Full Access Platinum Membership at a reduced rate? Complete the form to take part in our Group Membership savings. You must register within 24 hours of being matched. Offer cannot be combined with other specials or discounts. Watch live broadcast training from home! Can be added to any available membership! This is an add-on membership to the Platinum or Pain Memberships and is included FREE with Diamond Memberships. It may not be purchased as a stand-alone membership.. NOTE: You can’t purchase a virtual stand-alone membership. Below are a few recommended membership bundles that include the virtual membership That You’re interested in. FAQ: Check out our top 5 frequently asked questions to learn more about memberships! We created an online tool to help you determine exactly how much you’d save if you had a membership based on the membership you select and the amount of courses you plan to attend. Feel free to give it a try below! NOTE: The calculations above account for our average course cost of $1,399 per course. Use the color-coded chart below to see which membership would be best suited for the courses you are interested in attending. Platelet Rich Plasma Training for Pain Mgnt. Yep! If you plan on bringing multiple people or want to join a membership with a group, we offer our Platinum and Diamond Office Memberships as well as our popular Group Membership. Join with 4 colleagues for only $3,599 each. Don't have 4 other colleagues at this time? Leave your name/phone number here and we will match you with 4 other of your colleagues.After the match, you must register within 24 hours. Want a Platinum Membership at a reduced rate? Complete the form to take part in our Group Membership savings. In addition to the ability to attend all the courses in your selected membership FREE, there are a number of benefits that come bundled with each membership. Click the items below to explore just some of the featured membership benefits! Pay only one price, and attend any or ALL programs as often as you like, any date, any location, and may repeat a course (at 50% off retail price). Membership begins when you attend your first class. NEW Member Benefit: Receive Premier Plus pricing on Neurotoxin and Fillers! Save thousands of dollars on XEOMIN®, Radiesse®, Belotero Balance®, Asclera®, and much more. Members get same Premier Plus Pricing as Empire on Botulinum and Filler products! What would otherwise take many years and a significant initial investment to receive this level of pricing, (Tier 5), Empire members will receive from day 1! ($699 value) Empire’s video library is now included with the Diamond Membership at no additional charge! Access our growing library of HD recorded, professional videos. Current series includes Aesthetics (over 9 topics from Botox to Lasers), and Interventional Pain Management. Newer topics will include Anti Aging, Regenerative Medicine, Hormone Pellet Therapy, Sexual Dysfunction, Thread Lift, and Hair Loss Therapies for Restoration. These are professionally recorded and edited On-Demand videos categorized with subchapters and include special features and effects. Our On-Demand series can be accessed and viewed from anywhere. Since we always save the best for last, here it is: The Empire On Demand Series is fully Accredited ! What better way is there to earn CME than while working at your own pace and at home? The Video Library will be accessible to Members Only beginning May 1, 2017. Regularly ($249 value) Empire’s attractive Gold Plated and Wood Framed Certificate is now included with the Diamond Membership! We want you to be proud of your participation within our educational programs and as part of your membership you will receive a customized and personalized plaque showing your patients that you are certified and professionally trained. This plaque allows patients and others to know that you have completed the necessary requirements to offer these new procedures within your specialty utilizing the "latest standard of care" within your training. Regularly ($599) This essential program packed with valuable and much needed information is now included with all Empire Memberships! Create a Higher Standard OF Care for Your Aesthetic Practice. This is a must for any Aesthetic Practice, particularly newer practices just starting out. Empire Medical Training has developed this comprehensive Aesthetic Kit after training physicians for over 20 years, working with start up practices, and consulting with established practices in Aesthetics. The information contained within form the very basis of any aesthetic practice and contain such necessary items concerning regulatory matters, forms and consents, documentation, standard techniques and proper protocols for performing a plethora of Aesthetic procedures in your practice. Also included within this kit is a separate CD with just about every consent form and aesthetic protocol which you can customize to your own practice. Empire Medical Training grants unrestricted use for the end user to utilize these documents within their own Aesthetic practice. The material may not be reproduced or used in any other fashion, please see disclaimers for more information. Lastly, but equally important, is the “Front Office Fundamentals” which again form the foundation to any Aesthetic Practice. It is often stated that even the most skilled, highly trained and credentialed practitioner is not assured of financial success in their practice without the proper marketing and practice set up. This manual goes over in extensive detail how to train your front office staff to be your font line in marketing and selling these procedures to your newly found patients. A community of Physicians, Nurses, Dentists, and all Health Care Professionals who want to expand their knowledge base and skills as well as interact with other members and professionals who share their same goals. Join our growing network of over 150,000 physicians, nurses, vendors, practice owners, students, and other interested in Health Care. Meet new people, network with other professionals, Ask questions, create new conversational threads, interact with our Expert Faculty, submit case presentations, post and read articles, watch videos, and much more. The Empire-Community-Forum™ is open to all professionals but the “Ask our Expert Faculty" section is restricted to members only. Regularly ($299) Now included with your Diamond Membership Plan! Empire’s marketing team will research the market trend in your geographic area and provide you with a detailed report regarding pricing for procedures performed in your area and a better understanding of your sales potential for various services. Great for Aesthetic practices just starting out where you may not be sure what price to charge for any given technique or newly learned procedure. Just let us know which procedures you are performing or want information on. Books and supplies, the medicines used (such as Botulinum Toxin and Fillers), your certifications and CME, and any elective treatments you may wish to receive during the training (many companies charge a premium to provide these treatments) are included. Get discounts on products you will need in your practice, from major Manufacturers and Vendors that Empire has contracted and negotiated with on your behalf over our 20 year history in business. All members are immediately upgraded to a “Silver Level Status” with MERZ PHARMA the makers of the Botulinum Toxin and other products you will use in Aesthetics. These manufacturers typically require physicians to spend an initial investment and work their way up to this “silver level status”. Diamond Members may register for classes anytime up to 72 hours prior to event. Gain access to your own personal account manager who will maintain your certifications and cme accreditation as well as help you register for any classes you want to attend by either emailing your account manager or calling them directly. Join our network of over 150,000 Physicians, Vendors, Manufacturers and other thought leaders in the industry. Network and learn from your colleagues and participate in special events only available to members. IF your goal is to improve your lifestyle by enhancing your practice and patient care, our network can help you achieve your goals. The faculty at Empire Medical Training represent the very best in medicine and have taught with Empire for over 20 years. Our Physician instructors are specialists in their field and are practicing Physicians as well. Other instructors include Anatomy professors and individuals highly qualified to provide instruction to our attendees. Empire is the original educator to physicians and other practitioners with over 20 years’ experience and over 100,000 individuals trained. You can feel confident that the training you receive will be the better than what you expect. If you need additional training after attending a workshop, we will arrange 1-on-1 training for you at no charge. (vendors, you will pay less). Empire Medical Training is now providing Job Placement and Recruitment services for Employers and Health Care Professionals seeking employment, throughout the United States. This is a free service for all graduates of Empire Medical Training. Lowest Possible Tuition on all Memberships. Price Increase soon, don’t miss this. You won't see this low prices and big discounts in a long time. Get Cheryl Whitman’s (Beautiful Forever) entire absolutely FREE! Valued at over $2,499, Empire will pay for you to have this training! 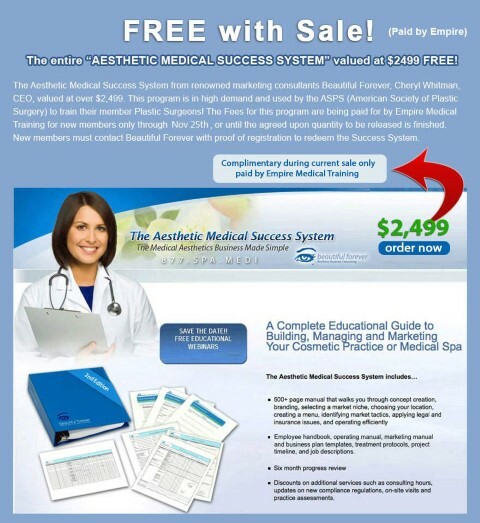 This system is very valuable and used by The ASPS to training their plastic surgeons! Everyone else paid $2,499 and more, Empire is paying for yours till next Monday To redeem you must send Beautiful Forever proof of registration. New Members Only, till limited supplies Last or through deadline. Through next Monday, receive complimentary Video Library, Empire Live Broadcast and over $3,000 worth of products and Services. Regularly charged separately , now included with Annual Sale! Hurry, offer will end. Thinking about attending PRP? Well guess what, PRP is included free with the Diamond Membership! Thinking of attending “The Pain Show” Normally is $2,999 with the Diamond Membership, during special pricing, Diamond Members only need pay $1,499, not $2,999! This is a must for any Aesthetic Practice, particularly newer practices just starting out. 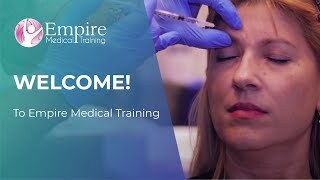 Empire Medical Training has developed this comprehensive Aesthetic Kit after training physicians for over 18 years, working with start up practices, and consulting with established practices in Aesthetics. Dysport® is a registered trademark of Ipsen Biopharm Limited - Xeomin® is a registered trademark of Merz Pharma GmbH & Co. KGaA. JUVÉDERM® mark owned by Allergan Industrie SAS. - Botox® is a registered trademark of Allergan, Inc.- cited on Botox Training page.